Laughing Squid is teaming up with Flora Grubb Gardens, Ritual Coffee Roasters and Black Rock Arts Foundation (BRAF) for a special summer event on a tropical island oasis in uncharted city waters. 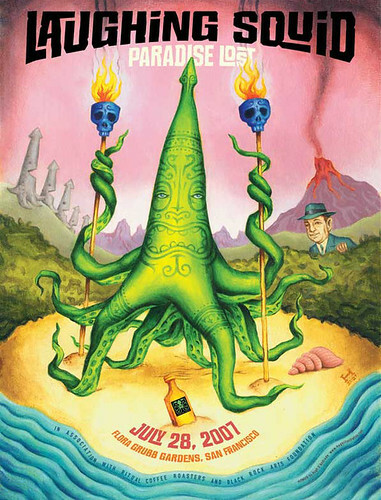 The squid tiki gods welcome you join us for ritual reverie in the green gardens, but beware, there are rumors of party plundering pirates about in this lost botanical paradise. – At the last minute, The City of San Francisco and the SFPD have canceled the fire art that we had planned for the event, of course only after making us jump through some stunning bureaucratic hoops and requiring us to pay even more money than they originally requested of us. There’s a bigger story here that someone should write about. – Show up early. We can’t emphasize this enough. If we have too many people, we may have to hold the door until others leave. Oh did I mention the part about showing up early? The doors open at 6pm. This event is on the early side, from 6pm to 12 midnight. – The event takes place in Bayview and neighborhood can be a bit tricky. Be aware of your surroundings, travel in groups if possible and do not leave anything in your vehicle. – Due to the ABC and event permit restrictions, this event is 21 and over only. That means no babies, children, teenagers, etc. This is not your typical event venue. Paradise Lost takes place at the beautiful new Flora Grubb Gardens, which is also home to the new Ritual Coffee Roasters (their second location). Here are some photos I shot of the location right after they opened for business. Black Rock Arts Foundation (BRAF) will be running the bars. This event is also a fundraiser for their organization which helps to support and promote community-based interactive art around the country. In addition to the main BRAF bar, there will be a special pirate bar as well. Due to permit restrictions, this event is 21 and over. Tickets are $10 and only available at the door. It is possible that this event will sell out, so show up early. The theme is tropical, tiki, jungle, safari, pirate, nautical etc. and you are encouraged to dress accordingly if you so desire. Hugh D’Andrade created an amazing poster that we will be giving out at the event. Noonaco! will be selling our Laughing Squid t-shirts at the event, as well as giving away our stickers and buttons. Parking is on the street and it is unsecured. The best areas to park are on Innes Street and Jerrold Street near the event. Do not leave anything in your vehicle. The neighborhood can be a bit tricky at night. Here’s a map of the area. Flora Grub Gardens is accessible via the new T-Third light rail. Please do not bring any dogs or other animals to the event. Here’s the event on Upcoming and Facebook. Feel free to tag your photos and video “Laughing Squid” and “Paradise Lost”. Lifecasting and event streaming is encouraged.